On August 22nd, 2016, Consul General Hong Lei met with Mark Holland, Mayor of Kansas City, Kansas, at the City Hall. 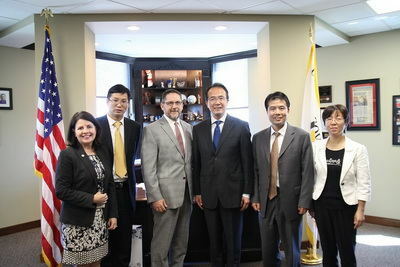 Consul General Hong Lei said that Kansas City is an important city in the state of Kansas. The bilateral economic and trade cooperation and people-to-people exchanges have been expanding constantly, and Kansas City is attracting lots of Chinese investment, tourists and students. With China’s growing market potential, China and Kansas City can further expand cooperation in the fields of investment, aviation, agriculture. Mayor Holland welcomed the visit of Consul General Hong Lei, and made an introduction of the social and economic development of the City. He said Kansas City, with its advanced infrastructure and location in the heart of the Midwest, is quite advanced in the aviation, mechanical, chemical industries. The City welcomes more Chinese enterprises, visitors and students, and expects more cooperation and exchanges with China in trade, investment, culture and education.